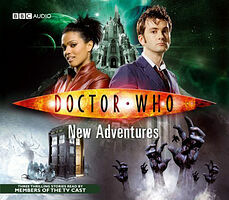 Note: This page lists new series Doctor Who audios only. Classic series CDs have their own separate section. Most of the new series CDs are audio readings of the BBC's popular range of new series novels; also included are a couple of documentaries and an ever-growing number of audio-exclusive audio readings (i.e. not based on novels) — for example, Pest Control. In late 2013, AudioGO (parent company of BBC Audio) filed for bankruptcy and the Doctor Who audio range came to an abrupt halt. The rights were subsequently purchased by Random House, and CD releases resumed under the new label "BBC Physical Audio" in November 2014.